Branford Attorney David Minicozzi has been practicing law since 1988 and began his own practice in 1994. Today, the Law Office of David C. Minicozzi offers assistance with personal injury, real estate, family law, wills and probate, criminal and civil matters. Attorney Minicozzi received his B.A. in political science from the University of Connecticut, and earned his degree in Law from Western New England University School of Law in Massachusetts. 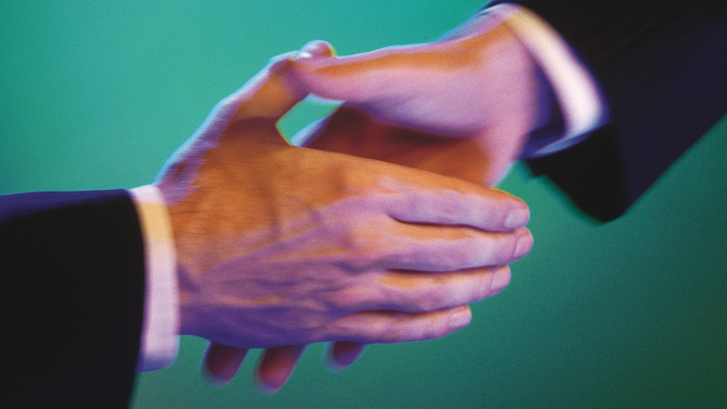 He is a member of the New Haven County Bar Association, and a Certified Divorce Mediator. Dave is an affiliate sponsor of the New Haven-Middlesex Association of Realtors. He actively supports the community through involvement in the East Haven Chamber of Commerce, the Branford Lions Club, the Branford Green Committee, the Widow’s Son Masonic Lodge #66 A.F. & A.M., and St. John Bosco Parish in Branford. He was twice honored as a Branford Chamber of Commerce Volunteer of the Year, and received the New Haven Lions Club Knight of the Blind Award and the Melvin Jones Award. Dave has been a shoreline resident since 1974 and lives with his wife Joann in Branford. 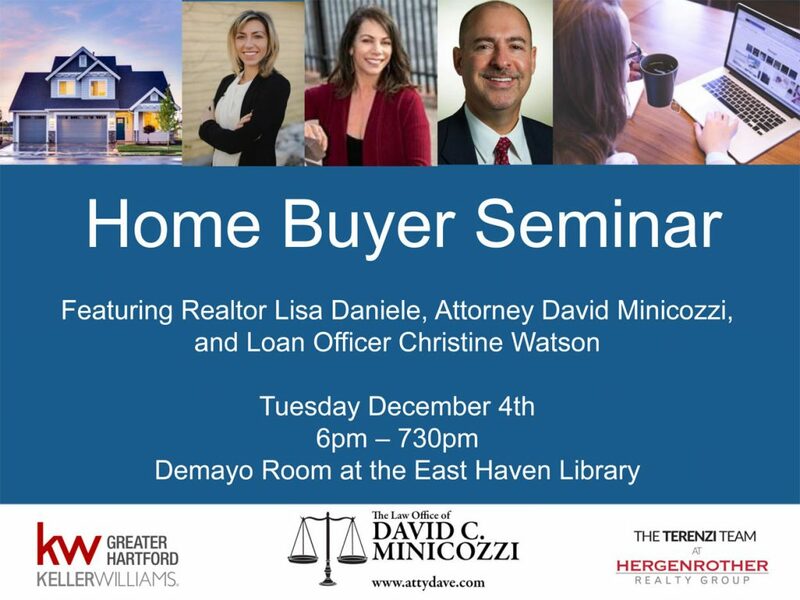 Join us for our upcoming Home Buyer Seminar featuring Realtor Lisa Daniele, Attorney David Minicozzi, and Loan Officer Christine Watson on Tuesday December 4, 6:00 p.m. – 7:30 p.m. in the Demayo Room at the East Haven Library. 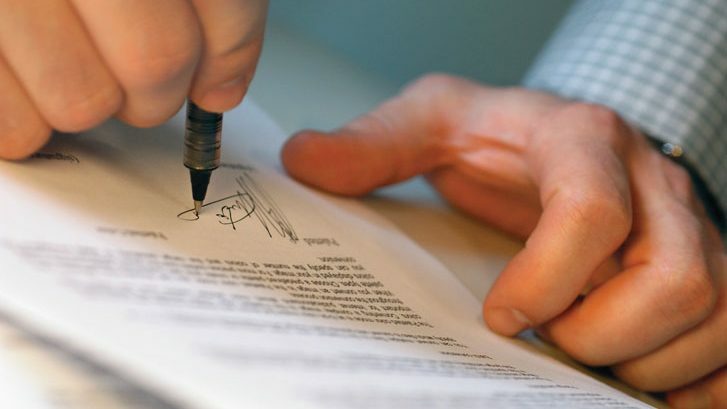 The trend lately is for banks and mortgage companies to perform “notary only” refinances. Homeowners are told it is convenient and cost-effective. What isn’t discussed is that someone needs to obtain the Release of the old mortgage, file it at the Town Hall, and clear your title. 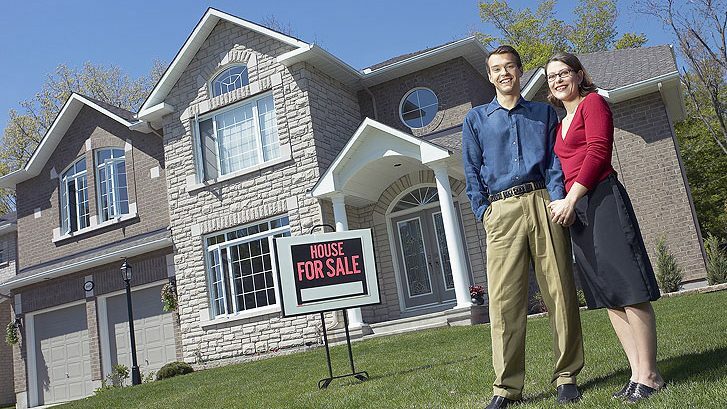 Failure to do so will impair your ability to sell or further refinance your home. You also may not be provided the option to obtain Owner’s Title Insurance. 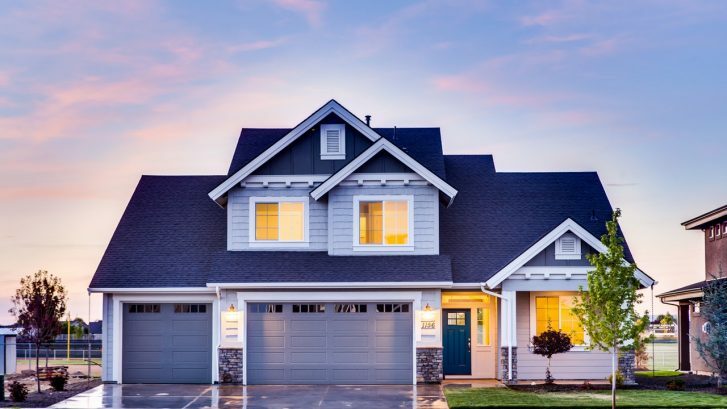 This protects you from future claims against your home due to a faulty title search, boundary disputes and other frightening scenarios. Attorneys are excellent at explaining these issues, facilitating the refinance process, clearing up lingering issues from the original purchase, and answering your questions along the way. A notary will not do this. 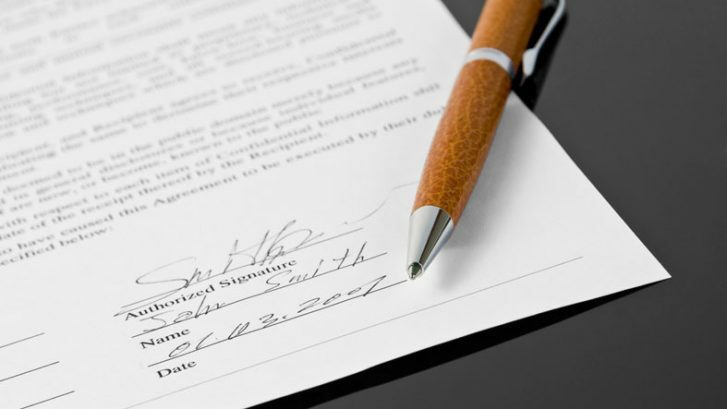 The attorney will explain the legal significance of the important documents you sign. A notary will not (and by law shall not) explain them because they act only in the capacity of an official witness. Massachusetts has taken steps to mandate an attorney be used in residential refinance transactions. 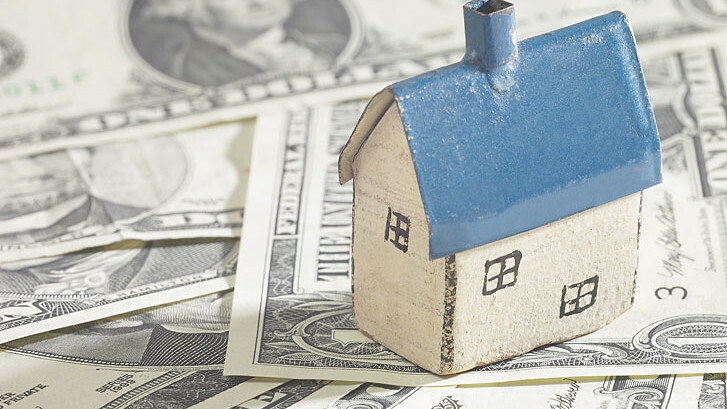 They recognize a refinance is an important transaction that affects your most important possession: your home. In today’s world, an unfortunate trend exists to discount the use of an attorney in certain type of situations. 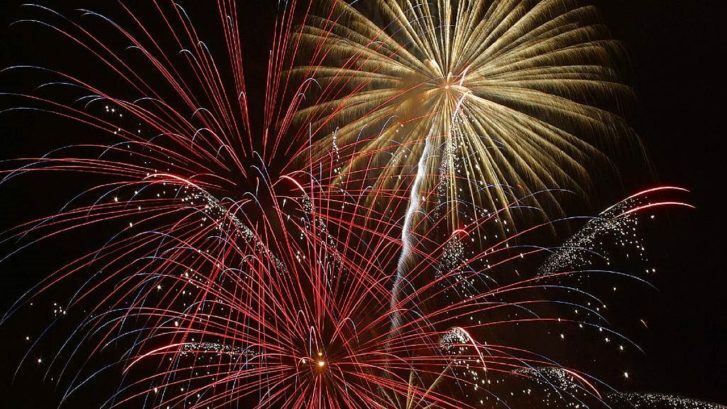 People are told “oh, it’s just a simple transaction,” or “anyone can write that,” or my favorite, “you can save time and money by having a notary or a paralegal do it, or even do it yourself.” Maybe. But by the time you find out a mistake was made it may be too late. Don’t let that happen to you. Call The Law Office of David C. Minicozzi 203-483-7069 or 203-804-0841 to schedule a consultation today. Buying a home is one of the biggest decision you will make, and it’s important to be equipped with the right information before you start the journey. Join us on Saturday, October 28 from 9:30am-11:30am at the Blackstone Memorial Library (Branford) to learn all about the home buying process and what you can expect. If you are thinking of purchasing a home in the near future, this seminar is for you! Bring a friend and have all of your questions answered. Free and oen to the Ppublic. For more information, please call 203-804-0841. Is it time to prepare your will and estate planning? “I have been Attorney Minicozzi’s client for more than 20 years. He is thorough, honest, and always helpful, whether it is a real estate matter or guiding us through the will-probating process. He also has infinite patience when answering our questions, which gives my wife and me great comfort and confidence in him. I will continue to use David; he is the best!” — James F.
Let Attorney Minicozzi help you with your Wills & Estate issues: last wills & testaments, living wills, and probate matters. Call the Law Office of David C. Minicozzi 203-483-7069 or 203-804-0841 to schedule a consultation today. Let Attorney Minicozzi help you with your real estate transactions: purchases, sales, refinances, residential and commercial, and reverse mortgages. Call the Law Office of David C. Minicozzi 203-483-7069 or 203-804-0841 to schedule a consultation today. Unfortunately, divorce is a common occurrence. According to the American Psychological Association, 40 to 50 percent of married couples in the U.S. will face divorce. Having spent the past 29 years as an attorney on both sides of divorce proceedings, I can tell you, it is never an easy process. However, there are some things you can do to make sure you don’t make some of the common mistakes. Check out her article “4 Common Divorce Regrets – and How to Avoid Them”, then contact the Law Office of David Minicozzi 203-483-7069 to set up a consultation today. A “Living Will” is an advance directive that allows removal from life support if you are found to suffer from a “terminal condition” and to be “permanently unconscious.” Connecticut law discusses at least three types of advance directives in this area. Each one is a bit different from the other two. They are not “one size fits all.” The proper advance directive should depend on whether you want to: simply choose a person to make health care decisions for you, give that person the additional power to make end-of-life decisions, name a Conservator to make health, financial and other decisions if you are incapacitated but not terminal and unconscious, and/or make anatomical gifts. These choices have legal consequences. They should be carefully considered and discussed with an attorney to be sure they fit your circumstances, that the documents are properly written, and that they are properly signed, witnessed and acknowledged. The time to find out you made the wrong choice, or that the documents were improperly drafted, is not when you are in the hospital. The first decision a small business owner must make is: are they going to run their business in a business-like manner? That includes the process of creating the business. Creating an LLC – Limited Liability Company – can be a wise choice. But creation needs to be done correctly. Connecticut law provides for certain minimal requirements, however, if the LLC is going to borrow money, or if it is audited, the bank and the IRS will look for further documentation you should have obtained at the time of its creation. If you do not have that documentation it will impede or destroy your ability to borrow money. And that IRS audit will be quite miserable. An attorney can assist in avoiding these pitfalls.